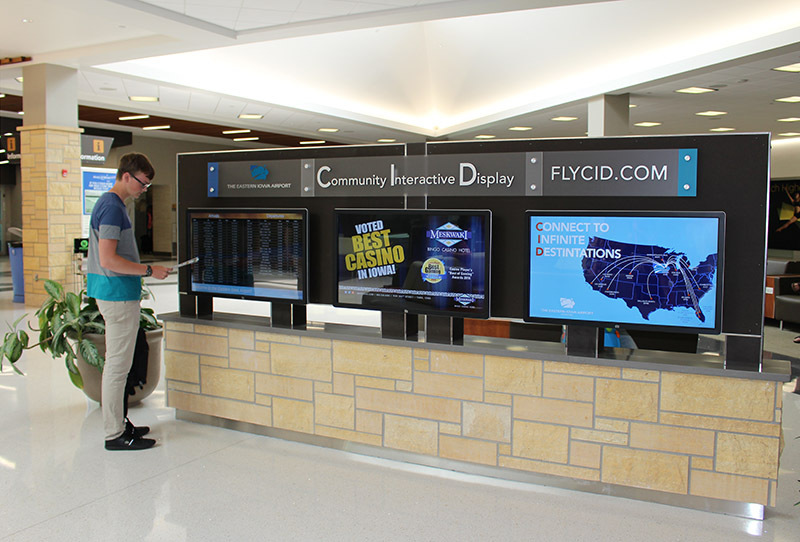 Digital signage was an important part of the recent Airport remodel. A 6 monitor double sided kiosk was positioned in the middle of the arrival lobby and a 3 monitor video wall on the front of the information desk were envisioned in the architectural plans. For the airport digital signage information kiosk, the management team wanted each of the airport digital signage displays to show different content. They wanted one monitor to show commercials for paid advertisers managed by Clear Channel, another monitor to show airport information and the last monitor to display the Flight Information (FIDS) or real time data integration. 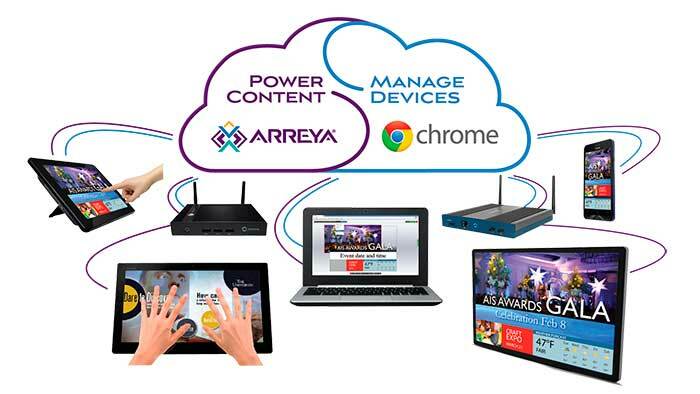 Arreya Digital Signage Service makes the different content and video wall integration easy. The FIDS information or real time data feed required some custom development by the Arreya technical team. The addition of a simple slideshow changes the digital signage content between flight arrivals, departures and the flight maps. To run multiple channels of different content at different locations, the airport chose the single platform, Arreya Digital Signage Service. The Arreya channel system allows each monitor to be a different channel, but with the convenience of management under one Airport account. All the content and the displays are remotely managed through the cloud. The addition of the Google Chromebox with Chrome Enterprise Management to each display allows remote management and locks the devices into a single app kiosk mode. This ensures the Arreya airport content is the only URL. No one can access or change the designated URL set up by the airport and if the internet connection is lost, the content is cached on the Chromebox for uninterrupted viewing. The built in real time analytics that are included in every Arreya subscription make it possible to sell paid advertising. Most advertisers want to know how often their ads are viewable. The paid advertising on the airport digital signage provides real time analytics to show interaction and which devices are being used. Paid advertisers know which ads are being viewed, Advertising can be easily updated for better demographic targeting.